In this post, some simple astrological methods are used to look at the charts of Hillary Clinton and Donald Trump. Before I go to the astrology, I will say a little about my feelings about Trump. My view of Clinton is positive and my view of Trump is negative, so there is an inherent bias for Clinton in what follows. I believe Trump has been working toward his goal of the presidency for a long time. To me, he is unabashedly using the playbook used by Hitler when Hitler won elections in Germany in the 1930’s. A saving grace – to America – might be that, like many sequels to many successful movies, Trump is following the form rather than the essence of what came before. Hopefully he is not driven by the hate and paranoia of Hitler. I suspect his television show was part of his strategy to win. His main role on the series seemed to be to impose his will on people below him, and by extension, the viewing audience. He seems to be trying to win this election through dominance as opposed to having anything to offer. To me, it seems the Republicans have been gambling with the fascist game for many years now. And they now have what they deserve. I think he appeals to many men and women who have played by the rules and do not feel like they have the power and respect they should. Many men, like my husband, who supports Trump, worked their full working life, served in the military, and supported wives and children, and feel marginalized by the changing economic and demographic America. Enough. On to the astrology. Hillary (Dianne Rodham) Clinton was born on October 26, 1947, at 8:02 AM CST, in Chicago, Illinois. Donald John Trump was born on June 14, 1946, at 10:54 AM EDT, in Jamaica, New York (both times from http://astrodatabank.com). Clinton’s birth time is suspect but Trump’s is rated as AA – from the birth certificate. In this post, I will use the point that I call Vulcan, which is the midpoint of the four asteroids Juno, Vesta, Ceres, and Pallas, over the shortest arc, as the ruler of Libra. I will use a newer point that I call Cent, which is the closer of the two midpoints of the Centaurs Chiron and Pholus – the only two civil centaurs and the first two to be discovered as part of the class of centaurs, as the ruler of Virgo. Both points are my own creations and Cent seems to explain a lot in my very Virgonian chart. (It is interesting to note that Cent flips 180 degrees every 100 years or so. The last time was around the beginning of Worl War II.) The other rulers will be the regular modern rulers; Sun ruling Leo, Moon ruling Cancer, Mercury ruling Gemini, Venus ruling Taurus, Mars ruling Aries, Jupiter ruling Sagittarius, Saturn ruling Capricorn, Uranus ruling Aquarius, Neptune ruling Pisces, and Pluto ruling Scorpio. Below are Clinton’s and Trump’s charts. Clinton’s chart is first, then Trump’s. The charts were created using the software Kepler. I added the placements of Vulcan and Cent. (An ephemeris for Vulcan and Cent can be found at http://vanwardstat.com/vulccent.8.5.16.rtf or http://vanwardstat.com/vulccent.8.5.16.pdf. Some similarities between the charts are, 1) both have the Moon – caring and being fickle – in the fourth house of patriotism, security , and the home, 2) both were born under a gibbous moon, know for crossing the t’s and dotting the i’s – Clinton’s Moon had just entered the gibbous phase and Trump’s was just about to leave the gibbous phase, 3) both are eclipse babies – Clinton was born a few weeks before a South Node solar eclipse and Trump was born a couple of hours before a South Node lunar eclipse, 4) both are highly nodal – Clinton’s Ascendant/Decendent axis is conjunct the nodes and Trump’s Sun/Moon opposition is conjunct the nodes, 5) both have Mars and Pluto in Leo – Clinton’s in the balsamic phase and Trump’s in the new phase, 5) both have Venus and Mars in water signs – they are both sensitive when it comes to feeling and competing. One last thing, they are both inexperienced politicians – which makes things interesting. For hemisphere emphasis, most of Clinton’s energy is focused outward. She has 8 of the 12 planets (I will call the Sun, Moon, Pluto, Vulcan, and Cent planets, even though they are not, for simplicity’s sake.) above the horizon and 4 below. Her Sun is above and Moon below. On the east, she has 7 planets, on the west 5, so she is fairly balanced between being self directed and other directed. Her Sun is on the east and her Moon, the west. Trump also has the Sun in the southeast and the Moon in the northwest (east is to the left, north is to the bottom, west is to the right, and south is to the top in the chart of a horoscope). Trump is not as balanced as Clinton. He is a self directed person, with 9 of his 12 planets to the left of his chart, and 3 to the right. Those planets to the right are to the north, so when he does get feedback from others, he reacts internally. Trump is fairly well balanced between the internal and external worlds, with 7 planets to the south (external) and 5 to the north (internal). Trump is lacking planets in the southwest. He has no objective connection to the other. His reactions to others are purely subjective. I will say a little bit about their two Suns and the Nodes. 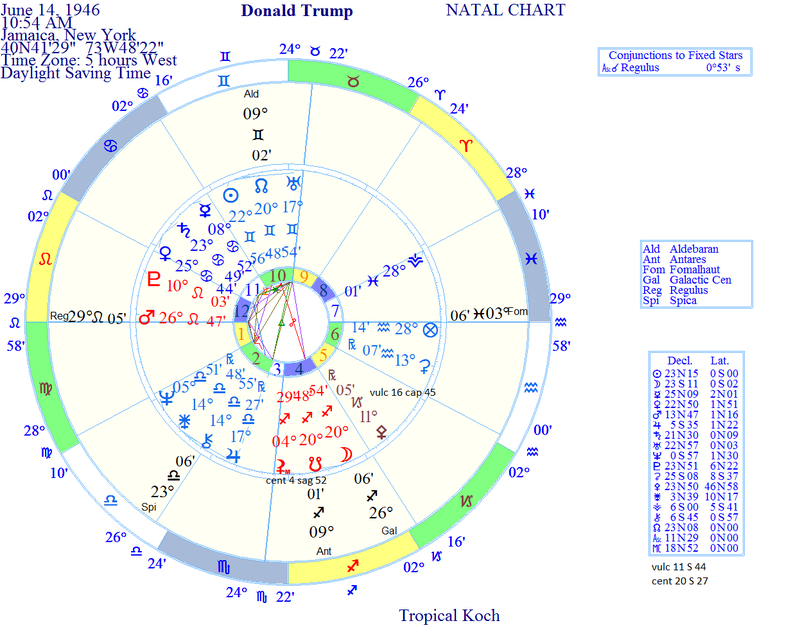 Trump’s Sun is in the 10th house, conjunct the North Node and Uranus, all in Gemini. So, good timing, showing off, and intuiting are all linked together in a witty, flighty way in the area of fear, reputation, and government. With the North Node in the 10th and the South Node in the 4th, he is very visible. 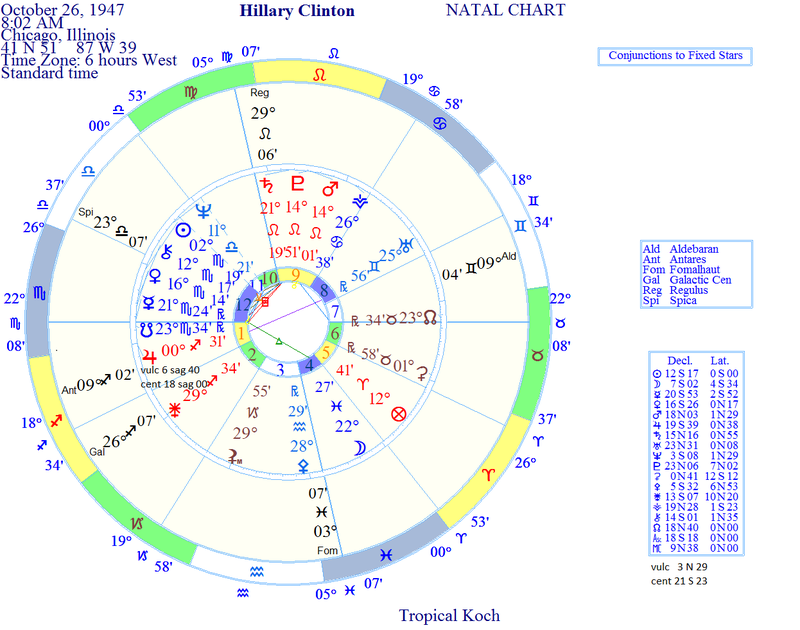 Clinton’s Sun is in the 12th house in Scorpio and makes no conjunctions. The planets Venus and Mars are also in the 12th house and conjunct the 1st house, Scorpio South Node. All of the 12th house planets are approaching the South Node. With the North Node being a point of connection, the South Node disconnection, and the 12th house being the house of the hidden, it is hard for Clinton to get noticed. But intense compassion is a focus of her life. She shines and shows off in the twelfth house. With her South Node conjunct her Ascendent, her personality and appearance are unpopular, while with the North Node conjunct the 7th house cusp, Bill’s personality and appearance are very popular. The South Node conjunct the ascendant is an aspect she shares with Obama. He seems to be able to handle it, but look at how popular Michelle has been from the outset. I do not believe it is any coincidence that the Republicans have focused on Clinton’s money making and communicating (Venus and Mercury) or, Trump, her body (the Ascendant). The South Node can be an Achilles heel. Trump’s Achilles heel is in his caring and being fickle in the area of his home and patriotism, in an adventurous, over-optimistic way. I will now go through the charts planet by planet using the keywords. Clinton has the Sun in Scorpio in the 12th house. She shines/shows off in the area of compassion and the hidden, in an intense, deep way. Trump has the Sun in Gemini in the 10th house. He shines/shows off in the area of reputation and government in a witty, flighty way. Trump has the Moon in Sagittarius in the 4th house. He cares/is fickle in the area of the home, patriotism, and security, in an adventurous, over-optimistic way. Clinton has the Moon in Pisces in the 4th house. Clinton cares/is fickle in the area of the home, patriotism, and security, in a compassionate, confused way. Clinton has Mercury in Scorpio in the 12th house. She thinks/is shallow in the area of the hidden and and compassion, in an intense, deep way. Trump has Mercury in Cancer in the 11th house. He thinks/is shallow in the area of goals and friends, in a caring, moody way. Trump has Venus in the Cancer in the 11th house. He makes money/feels in the area of goals and friends, in a caring, moody way. Clinton has Venus in Scorpio in the 12th house. She makes money/feels in the area of the hidden and compassion, in an intense, deep way. Clinton has Mars in Leo in the 9th house. She competes/gets angry in the area of beliefs and foreigners, in an open, proud way. Trump has Mars in Leo, too, in the 12th house. He competes/gets angry in the area of the hidden and compassion, in an open, proud way. Trump has Vulcan in Capricorn in the 5th house. He relates/vacillates in the area of children and fun, in a disciplined and strict way. Clinton has Vulcan in Sagittarius in the first house. She relates/vacillates in the area of appearance and awareness, in an adventurous, over-optimistic way. Clinton has Jupiter in Sagittarius in the 1st house. She expands/pontificates in the area of awareness and appearance, in an adventurous, over-optimistic way. Trump has Jupiter in Libra in the 2nd house. He expands/pontificates in the area of money and values in a beautiful, wishy-washy way. Trump has Saturn in Cancer in the 11th house. He fears/structures in the area of friends and goals in a caring, moody way. Clinton has Saturn in Leo in the 9th house. She fears/structures in the area of beliefs and foreigners, in an open, proud way. Clinton has Uranus in Gemini in the 8th house. She befriends/intuits in the area of terror, transformations, and the occult, in a witty, flighty, way. Trump has Uranus in Gemini in the 10th house. He befriends/intuits in the area of reputation and government, in a witty, flighty way. Trump has Cent in Sagittarius in the 4th house. He labors/heals in the area of home and patriotism, in an adventurous, over-optimistic way. Clinton has Cent in Satgittarius on the cusp of the 2nd house – which is what I will delineate. She labors/heals in the area of money and values, in an adventurous, over-optimistic way. Clinton has Neptune in Libra in the 11th house. She idealizes/confuses in the area of friends and goals, in a beautiful, wishy-washy way. Trump has Neptune in Libra in the 2nd house. He idealizes/confuses in the area of money and values, in a beautiful, wishy-washy way. Trump has Pluto in Leo in the 12th house. He investigates/terrorizes in the area of the hidden and compassion, in an open, proud way. Clinton has Pluto in Leo in the 9th house. She investigates/terrorizes in the area of beliefs and the foreign, in an open, proud way. I will now go through the houses, where the house placement of the ruler of a house is the area stimulated by activity in the house. Clinton’s 1st house is ruled by Pluto, which is in the 9th house. Her awareness and appearance stimulate her joy. Trump’s first house is ruled by the Sun, which is in the 10th house. His awareness and appearance stimulate his fears. Trump’s 2nd house is ruled by Cent, which is in the 4th house. His possessions and values stimulate his sense of security. Clinton’s 2nd house is ruled by Jupiter, which is in the 1st house. Her posessions and values stimulate her anger. Clinton’s 3rd house is ruled by Saturn, which is in the 9th house. Her thoughts and communications stimulate her joy. Aquarius is intercepted in the 3rd house, and Uranus is in the 8th house. On a more hidden level, her thoughts and communications stimulate her terror. Trump’s 3rd house is ruled by Vulcan, which is in the 5th house. His thoughts and communications stimulate his happiness. Trump’s 4th house is ruled by Pluto, which is in the 12th house. His home and patriotism stimulate his sorrow. Trump has Sagittarius intercepted in the 4th house, with Jupiter in the 2nd house. On a more hidden level, his home and patriotism stimulates pleasure. Clinton’s 4th house is ruled by Neptune, which is in the 11th house. Her home and patriotism stimulate her friendliness. Clinton’s 5th house is ruled by Mars, which is in her 9th house. Children and fun stimulate her joy. Trump’s 5th house is ruled by Saturn, which is in his 11th house. Children and fun stimulate his friendliness. Trump’s 6th house is ruled by Uranus, which is in his 10th house. Work and health stimulate his fear. Clinton’s 6th house is ruled by Mars, which is in the 9th house. Work and health stimulate her joy. Clinton’s 7th house is ruled by Venus, which is in the 12th house. Her marriage and open enemies stimulate her sorrow. Trump’s 7th house is ruled by Uranus, which is in the 10th house. His marriage and open enemies stimulate his fear. Trump’s 8th house is ruled by Neptune, which is on his 2nd house. Transformations and the occult stimulate his pleasure. Clinton’s 8th house is ruled by Mercury, which is in the 12th house. Transformations and the occult stimulate her sorrow. Clinton’s 9th house is ruled by the Moon, which is in the 4th house. Her beliefs and dealings with foreigners stimulate her sense of security. Clinton has Leo intercepted in the 9th house. The Sun rules Leo and is in the 12th house. On a more hidden level, her beliefs and dealings with foreigners stimulate her sorrow. Trump’s 9th house is ruled by Mars, which is in the 12th house. His beliefs and dealings with foreigners stimulate his sorrow. Trump’s 10th house is ruled by Venus, which is in the 11th house. His reputation and the government stimulate his friendliness. Trump has Gemini intercepted in his 10th house. Gemini is ruled by Mercury, which is in the 11th house. On a more hidden level, his reputation and the government stimulate friendliness, too. Clinton’s 10th house is ruled by Cent, which is essentially in her 2nd house. Her reputation and the government stimulate her pleasure. Clinton’s 11th house is ruled by Vulcan, which is in the 1st house. Her friends and goals stimulate her anger. Thrump’s 11th house is ruled by the Moon, which is in his 4th house. His friends and goals stimulate his sense of security. Trump’s 12th house is ruled by the Sun, which is in the 10th house. His secret enemies and the hidden stimulate his fear. Clinton’s 12th house is ruled by Vulcan, which is in the 1st house. Her secret enemies and the hidden stimulate her anger. Clinton is more balanced than Trump. Her focus in on the helpless. But it is hard for her to get who she is out. Trump’s focus is on those in authority. And he is very visible. Both are patriotic, but patriotism is a negative for Trump. For Clinton, her personality is a negative. Diplomacy is a positive for Clinton, while professionalism is a positive for Trump, I find Trump a blowhard. To me, Clinton has worked all of her life for the helpless, Trump for himself. In Recovery International, Dr. Low writes about defeat after victory. He thought that one of the techniques that Hitler used in making war was to let the Allies win and feel confident, then hit them hard when their guard was down. Since Trump seems to be following Hitler, it would not surprise me if that is what Trump is up to.